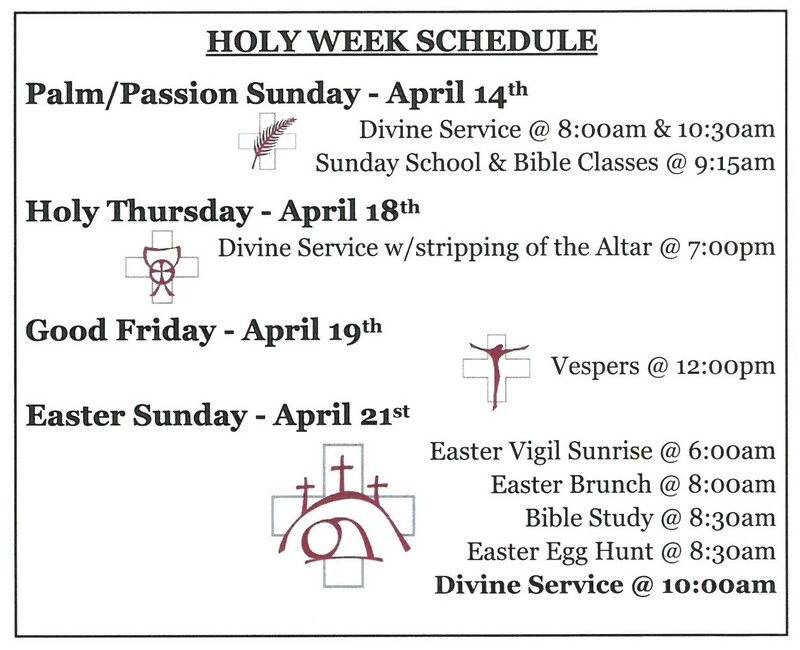 Sunday Services Wednesday Services Holy Week Services Click dropdown menu above for services. Note: additional special services or time changes will be visible on the home page. ASH WEDNESDAY service is March 6th @ 7pm. (Lent Midweeks begin 3/13/19) Evening Prayer @ 7:00pm. (May-August) Evening Service @ 6:30pm. (December) Evening Prayer @ 7:00pm on 12/5, 12/12, & 12/19. Services will be either Evening Prayer or Vespers from the Lutheran Service Book. Note: Black text = service currently offered. Additional special services or time changes will be visible on the home page. A Missions-presentation will be led by our own Rev. Fred Reinhardt at 6pm. Church Service following at 7pm. Christmas Eve Candlelight Service on (Mon, 12/24) @ 7pm. Christmas Day Divine Service on (Tues, 12/25) @ 10am. Divine Service with incense is on (Sat, 1/6/18) @ 12pm (noon).